Imagine being homeless. You are a mother with three kids. You and your kids are trying to make things work and pay bills and one day you lose your house. What would you do? Amanda was facing this issue with her kids when she called Families Forward, an organization in southern California that helps homeless families. After contacting Families Forward, she was paired with a caseworker that helped her find stable housing and a job. Her kids also benefited from Christmas and Back to School programs addressing the needs of her young family. In 2018, Families Forward helped over 284 families like Amanda’s find this kind of stability with jobs and housing. Amanda’s story was shared by Families Forward’s Director of Development Ms. Jen Granger during a presentation at California Rainbow’s annual Grand Sessions in Fresno in March 2018. Ms.Jen Granger was delighted and amazed to find out that California Rainbow had raised $61,341.80 dollars for Families Forward over the past year. Grand Worthy Advisor Alana presented Ms. Granger with a check representing the collective fundraising efforts of the members throughout the state. A service report was also presented at the event in which it was announced that in addition to fundraising efforts, Rainbow members had donated backpacks, food and toys to many of the Families Forward programs throughout as well as volunteered at their headquarters sorting food and inventory. Additionally, the membership of California volunteered a grand total of 8,198 hours to various service projects and made “Hope in a Bag” homeless care kits they could pass out to homeless throughout the state. 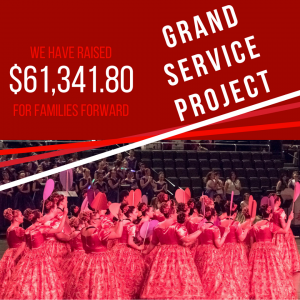 Rainbow Girls of California can be proud of their contribution toward helping homeless families and other charities this past year. Many children and parents have hope for the future and a stable lifestyle thanks to the generosity of California Rainbow.